1971 Chemical cleaning and expertization stamps, L. Novotný. 1939 CDV72/141 Stará Boleslav, CDS STARÁ BOLESLAV 23.III.39, good condition, rare usage! 1939 CDV72/39 Chrudim, CDS Seč 13.VI.39, very fine piece. Small usage! 1941 Sample without value - Ukázka tovaru, commercial envelope with 2x 20h Hlinka with CDS Prešov 22.II.41, good condition, exceptional franking! 1996 Falošné Hradčany, Dr.S. Šablatúra, as new. 1939 CDV72/148 Tábor, CDS Mirotice 29.IV.39, good condition Small usage! 1928 court letter franked with. mixed franking Postage due stamp 1CZK + postage stmp 60h Landscape Jasina used as postage-due, Pof.DL62, 236, CDS Odry 23.XI.28, sent back, stamp. crossed out blue by pencil; envelope cut from 2 sides, rare! 1890 - 1990 EUROPE, Czechoslovakia big comp. of stamps and letters, several kg modern letters CZECHOSLOVAKIA 1945-92 and abroad, part FP Austria-Hungary, cut-squares Czech Republic, supplemented with 5 stockbooks A4 + 7 stock-book sheets with stamp. Europe, all in/at 1 plastic přepravce, only personal taking-delivery. 1919 official response card sent as Registered, franked with. only Reg Surtax 25h, Pof.3, 8. Nationalized CDS Jedovnice 23.III.19. good condition. 1948 airmail letter from Tel Aviv 5.5.48 to Brno, with mixed franking of stmp Palestine and forerunner issue stamp. Israel. Rare! Without damage. 1906 Reg letter franked with. 3 color franking stamp. Franz Joseph, 2 + 3 + 30H, Mi.120, 121, 127. CDS Au Bregenzerwalde 22/7 06. Without damage. 1920 - 21 comp. 2 pcs of cuts post. dispatch-note with 2 strip 1000h - CDS Brno 5.II.21, 500h + 1000h - CDS Znojmo 24.XI.20. good condition. 1938 Czechosl. picture (!) CDV72/151 Teplice-Šanov, provisional pmk Teplitz-Schönau 9.X.38, addressed to to Bíliny, perfect condition, quite rare! 1919 - 20 CDV11, comp. 8 pcs of various uprated by. PC, from that 3x forerunner, remaining Hradčany. Various varieties and franking also quality. 1942 SERBIA commercial censored letter to Protectorate, with Mi.2, 3, 63, 58, 59. CDS Beograd 3.I.42. Without damage. 1919 - 20 CZECHOSLOVAKIA 1918-39 Hradčany - selection of 130 pcs entires franked with. Hradcany-issue stamp., mainly postcard, part letters and commercial cards. 1943 commercial letter with railway pmk Vlára pass - Brno / No.523 / 25.I.43. Superb. 1919 CDV 1 addressed. to Bosnia, returned back with cancel. ZURÜCK, CDS Prague 14/ 24.III.19, nice. 1920 - 1950 postcard selection of more than 5000ks(!) Ppc small format in/at 1 box from bananas, contains topography Czechoslovakia I., Europe, also congratulatory. Only personal taking-delivery, weight/scale ca. 22 kg. 1938 Mi.101-111, complete set., cat. 100MiM. 1940 Mi.746, 747, Blue Ribbon, Brown Ribbon, both mint never hinged. 1918 - 30 CZECHOSLOVAKIA 1918-39 larger comp. used stamp., mainly letterpress issue as Hradčany, issue Chainbreaker, Pigeon-issue tad.,1x 16 sheet stockbook A4 + 5x sheet A4 + 5x choice notebook, all in/at 1 box. 1918 - 50 CZECHOSLOVAKIA 1918-39 selection of freely scattered stamp. and cut-squares, supplemented with ca. 100 pcs of entires, mainly CZECHOSLOVAKIA 1918-39 (letterpress issues), smaller part BOHEMIA-MORAVIA and CZECHOSLOVAKIA 1945-92 All in/at 1 box, ca. 3 kg of material. 1941 commercial PC with violet propagandistic cancel. "V / Deutschland (Germany) siegt / an all Fronten (fronts) / für Europe!" franked/paid stamp. 60h with red cancel. Victoria Olomouc 23.VIII.41 (incomplete print). 1x hole from letter file/-s.
1945 Slavkovské issue 2x 60h + 2x 120h, Skalica 4x 1,50Kčs + 4x 2Kčs, 2 pcs of unissued (Preissig) 1Kčs, red and black color. 1920 - 23 CZECHOSLOVAKIA 1918-39 selection of 150 pcs of entires with issue Chainbreaker and Pigeon-issue, major-part on/for postcards. Various quality. 1984 - 92 CZECHOSLOVAKIA 1945-92 collection as business supply of stamps Pof.2652-3007, contains blocks of four, corners, PB, souvenir sheets, margins with dates of print, black prints etc.., all in/at 4 stockbooks Pofis A4, superb, suitable for businessmen, ysoký catalogue, We recommend it - profitable offer! 1920 AIRMAIL LABELS Prague - Paris, Prague - London and Prague - Strasbourg, always in 4 stripe with margin + print red CDS. 1950 - 54 2x postcard with railway pmk., Moravské Budějovice - Jemnice / č.551 / 8.V.50, Jeseník Spa - Olomouc / č.662 / 20.VIII.54. good condition. 1945 envelope Leopold Baťa Zlín, sent by air mail to Yugoslavia, with Linden Leaves, CDS Zlín 30.X.45, on reverse CDS + by hand "Examined", censorship Beograd + sent back with label "Ne postoji više". good condition. Interesting document/attribut! 1919 Austrian forerunner blank form request um Nachnahmeänderung - Request on/for annulment C.O.D., with Hradčany 50h violet Pof.15, CDS Schluckenau 10/11 19. Format A5, folded, stamp. light cut. 1919 court letter as Registered, fee zapraveny mixed provisional franking Legionaire stamp. 15h with overprint "D" and 10h postage-due, Pof.27, DL2. Nationalized CDS Nechanice 18/12 19. Without damage. 1986 Pof.2777VV, 20 block with margin, 3x stamp. with big brown stain in stamp. also margin. 1938 Mobilization FP card, FP-postmark 12/ 2.XII.38, in the middle folded, correspondence Gen. Svátka on/for arm.gen. Joseph Bílý (popraven nacisty). 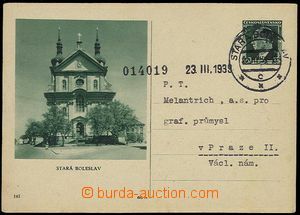 1949 letter with postmark Postal saving bank branch / Brno / 25.II.1949. with 2x 1 Koruna, Pof.417. Superb. 1938 Mi. 123 - 138, complete set Sloni, hinged, cat. 125MiM. 1923 CZECHOSLOVAKIA 1918-39 selection of more than 15 000 pcs stamp. issue Agriculture and Science 100h, Pof.173. All in box sorted to parcels according to types. 1966 - 72 CZECHOSLOVAKIA 1945-92 collection or rather business supply of stamps Pof.1548-1947, blocks of four, corners, PB, A, margins with dates of print, number sheets etc.. All in 4 stockbooks A4, suitable for businessmen, high catalogue value All in a luxury state We recommend it - profitable offer!! 1919 34 pcs of PC Hradčany, mostly postally Us, some uprated, interesting offer. 1941 - 42 BOHEMIA-MORAVIA selection of post stickers and blank forms: parcel label Express, Urgent, blank form on/for searching nedošlých mailing, Svazky and Uzávěry. 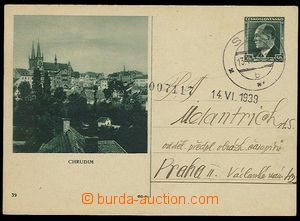 Total 7x sheet A4, 2x A5 and part/-s.
1922 Shares - bond on/for 500Ł Main town Prague with imprinted stamp on 10 Pounds, format A3, folded. 1965 Mi.52 - 54, birds, nepatr. hinged, cat. 14MiM. 1984 Michel catalogue South America 84/85, übersee band 2, good condition. 1998 Handbook for collector Hradčany, volume I, Hamr, Škaloud, good condition. 1935 6 pcs of entires from Carpathian Ruthenia, republic also Hungarian. 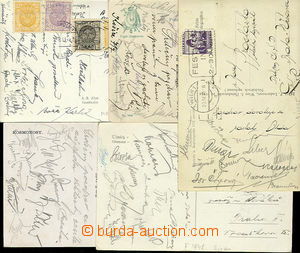 occupation, various franking also postmark, 1x R, 1x CDV, good quality. 1919 CDV10 uprated by. 2 strip express stmp 2h + Hradčany 1h, CDS Podmokly 5.XII.19. Without damage. 1978 - 84 CZECHOSLOVAKIA 1945-92 collection as business supply of stamps Pof.2292-2651, contains blocks of four, corners, PB, souvenir sheets, margins with dates of print, black prints etc.. All in/at 4 stockbooks Pofis A4, superb, suitable for businessmen, high catalogue value, We recommend it - profitable offer! 1939 letter to Hungary franked with. overprint stamp. Pof.350, Opening of Congress, special postmark Bratislava 18.I.39, on reverse CDS Bratislava 30.I.39 + arrival Budapest 939 Jan.31. good condition really post transported. 1945 CDV81/1, Slovakians by church, thin price, hand-made violet overprint. 1939 - 40 3 pcs cards with railway pmk., Vlára pass - Brno /523/ 26.IX.40 + 2x Kyjov - Mutěnice, from that 1x franked with. overprint stamp. good condition. 1919 - 38 comp. 12 pcs of Ppc with railway pmk, i.a. Jasina - Košice, Austrian Prague - Nixdorf, Polubný - Tanvald - Šumburk, Bardiov - Košice, Kúty - Veselí, Lučenec - Žilina etc..
1972 - 77 CZECHOSLOVAKIA 1945-92 collection as business supply of stamps Pof.1948-2291, contains blocks of four, corners, PB, souvenir sheets, margins with dates of print, black prints etc.., all in 4 pcs of new stockbooks Pofis A4, superb, suitable for businessmen, high catalogue value, We recommend it - profitable offer! 1919 whole forerunner Austrian parcel card with Hradčany Pof.20 2x, 5. CDS Wagstadt 4.VI.19. on reverse arrival. Only fold. 1944 miniature sheet For Children-issue Alb.H119, mint never hinged, cat. 700SKK.